I was recently asked by glamST.com to join their newly launched site and tell you a bit about it. GlamST describes itself as "the first virtual social tester." The website essentially allows you to try out new makeup products in a virtual environment, which is great for several reasons. First, it's literally risk free. I have spoken again and again about my fear of bold lip colors. I love seeing them on others, but I'm always sure I'll come off looking like I'm playing dress up. So I spent a good deal of time on GlamST playing with some orange shades that are hot this season and a variety of classic reds. I say this process is risk free because trying new shades can be scary. It can be expensive, take time to return unloved products, and at the very least you risk losing time getting ready in the morning if you decide to scrap a shade and try for something new. But on GlamST, you can see yourself and assess the look independent from those real-life risks. Second, the virtual environment serves as a way to save inspiration or looks you'd like to try out. 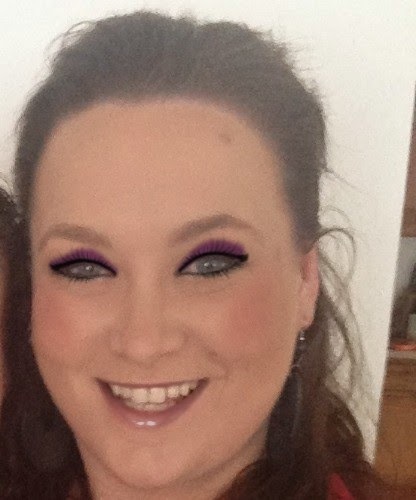 For instance, I did a "virtual makeover" using shades of purple. 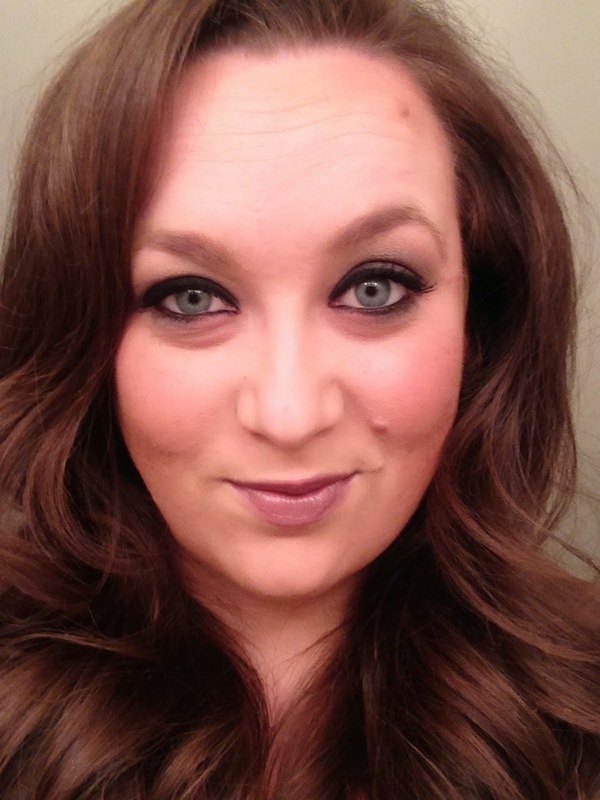 I employed purple eyeshadow, a purple tinted blush, and a plum glossy lip. I played around with several products and shades before striking a balance between coordination and over-matching. Remembering that this is a virtual makeover and can't perfectly replicate real life, I was impressed with how well the program applied the makeup to the proper areas of my picture. I noticed when I was creating this look I was a bit more daring than I would have been otherwise. I actually combined a rosy purple eyeshadow with one of my muted pink blushes to create a color similar to the blush I had discovered on GlamsST. I also went more bold with the eyes and lips than I did when creating the look virtually, and I think that's because I already knew I liked the safe colors. I was emboldened by this knowledge and just went for it. Finally, what's really neat about this site is that you can purchase the products you discover. It links to Sephora for checkout. I haven't actually used this feature yet, because I gave up online shopping for Lent. But I'm sure I will at some point! I do have to mention that this is a new site, and you can tell. I wish when I saved a makeover, I could later pull it up with all its details rather than just the image. I wish the social aspect included friends or followers on the site rather than just allowing you to share the looks on external social media. And I wish the makeup application gave you more options (for instance, when doing eyeliner, I appreciate the heavy top line, but others might want to experiment with varying intensity). I'm confident that these sorts of changes will soon be implemented. The GlamST team has been incredible to work with, and they seem extremely committed to making GlamST the best it can be. I encourage you to go create your profile and start experimenting today. It's easy: all you need is a Facebook or Google account to log in, then upload a picture of yourself. The site walks you through marking the photo so it can recognize where your eyes, lips, chin, etc. are located. So simple! This site sounds cool. I'll have to check it out! P.S. Why are you so gorgeous? !